This thread has 94 replies. Displaying posts 46 through 60. In what scenario have you seen that response, and with what TC interfaces? We had an MRX-10 (I believe) with the 780-ish remote as a demo system, where it seemed to drag compared to Elan, or even a CC remote. Similar setups in a few jobs that we took over, all used as A/V controllers only. No climate control, lighting, etc. All of this prior to 2016, haven't been back to those jobs, so I assume they have been working just as expected. I assume that is has improved significantly? While true, I wouldn't sell it to a client personally, just like I wouldn't sell a SR-150 if I was a C4 dealer. I'm sure it works for some situations, but it feels like lateral move from the remote that comes free with a DTV receiver. It's been my observation since the first Pronto controlled a TiVo that the TiVo remote (and later the DirecTV remote, and many cable remotes) could be learned to operate by touch. Our spiffy programmable remotes can't. A touchscreen can't be operated strictly by touch, which sounds like an oxymoron: you have to look at it to verify you touch it in the right place. The Pronto and later remotes required some kind of change to move from transport to menu control. I didn't even include numbers in that list when I wrote it because it never occurred to me that a remote might exist that doesn't have them. One of the first experiences I had with a projection system was seeing the Pioneer Laserdisc's STOP burned in at the top left of the screen! I think the IR remote is a step backwards into the 90's. Too bad you have to point the clumsy remote at the IR receiver. I've installed a few but never really felt proud about it! I certainly wouldn't put them in MY house! My wife would kill me after being use to rf and IP remotes! 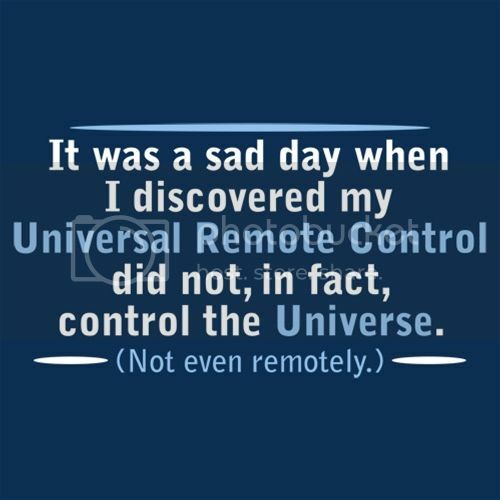 Not to mention that the remote looks like a $4 dollar remote that came with a cheap DVD player in the 90's! 9. Did I mention lead times? I can wholeheartedly agree with 3/9 and 8, but none of the others. I have very large, complex systems, some in commercial settings, that have been reliably online for years with zero issues. My RTI start post-dates the lead-free-solder-induced white screen failures and early battery problems, but I have T2C+, T3V and T2X remotes that have been in heavy use by families with young kids for years of durable service. They also offer a reasonable upgrade path for remotes that cannot be serviced. Charge docks have been less than stellar, but RTI has generally warranted and replaced them. If you don't like the remotes, you can deploy an iPad interface. As for the MX-810, Tom, I should clarify that I deployed the (then brand new) 810's for use with the MSC400...URC explicitly advertised the 810 to be fully compatible with that processor despite its horrific "wizard" programming interface but was not in practice. I appealed all the way to URC's VP of Engineering for relief but they left me hanging, so I moved on. Bottom line, every control system has its weak points and strong points...RTI is in no way the worst of the bunch, IMHO. Pick your poison. I agree that you pick your poison. I have stuck it out with RTi over the years because of Integration Designer. I have plenty of remotes out there still doing their job. Most of my clients have "moved on" to iPad minis and their iPhones. They love them and agree that it is way easier if they drop one. It is going to happen. Their kids use Ipads and are very comfortable controlling the system with it. APEX brings and new set of challenges. If RTi abandons ID then I will have no choice but to move on. I will not support that fiasco. I have put way too much time into ID and have an easy and simple interface for my clients with feedback. All RTi needs to do is improve the graphics selection and IP drivers list. If they spent their time on THIS instead of trying to fix what is NOT broke, they would allow us and them to make money, service our clients, and continue down a great path.
. They also offer a reasonable upgrade path for remotes that cannot be serviced. . In my experience, this is absolutely not true. When the T2C+ I ordered and programmed that came with a defect out of the box, RTI did nothing because they disco'd the T2C+ already and had bo replacements. The T2X was, I beleive ~6 months out from being released. We were left high and dry. C4 covers what you need. Not sure where you got the idea that the SR260 didnt have Numeric keys. It certainly does. It does REQUIRE a solid network if your going to any sort of network based control. That should go without saying. Most jobs I take over due to people firing their old installers are systems where the network needed significant attention. Linksys spaceship routers are the devil. Where the keys are located on the remote.. Who cares. You get used to what you use. You NEED icon based channel favorites, whip out your phone or get a tablet. Its costs NOTHING extra to use a Tablet or phone on the system. It doesnt even take up any programming time. For $600 in hardware, there's simply nothing else in the market that does what it does. This gets brought up a lot (for $600...). This goes for not just C4, but any of these types of systems. You HAVE to factor in the cost of the network as well if it is not already in place. Yes, $600 is a great price point and comparitively, will still be lower then the competition when factoring in the network for all of them, but the number is most like $1000 or more when you add a decent network. OF course, this is assuming you will use the remote for more than just a basic control. If that is all you are using it for, then you can get in for less than $600 and do everything you want. The transition out of the T2C+ (my all-time favorite remote) was absolutely a disaster. That said, RTI was left hanging by its part supplier that abruptly discontinued key parts leaving them with few options. Was RTI guilty of poor sales/supply forecasting and/or poor development planning..? Perhaps. But the situation overall was not of their making as I understand it. I completely disagree. The did not plan properly at all. They had zero t2c+'s to cover warranty replacements. That fault cannot be blamed on anyone but themselves. It should be part of any EOL plan for any equipment. It was handled horribly. When I sell automation and integration to clients I tell them they will be able to hand the remote to anyone that walks into their house and within seconds they will be able to use it with some level of competency. That means logical graphics and names, not icons. I don't want to tell a client that the "smiley face" will control their AppleTV. Honestly, if the buttons were replaceable and customizable I would be willing to sell if for secondary rooms. But without basic customization it just feels cheap to me, not high value. That is my personal take, not gospel.